Over the years Goffy has worked with lots of charities, especially Variety, the children's charity. This has not only included hosting events, but also arranging celebrities to attend, sourcing auction items and celebrity endorsements, and lots of TV, Radio & Press coverage to publicise the charity. 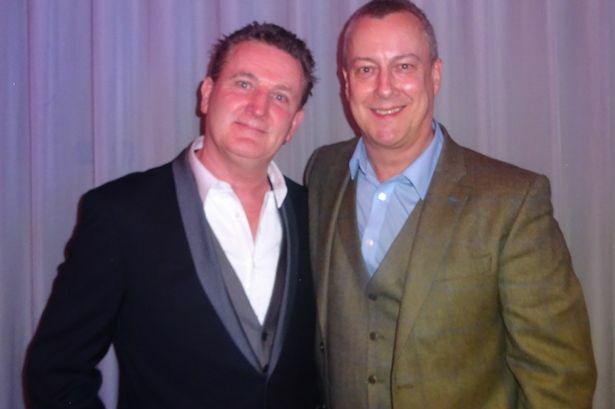 Events in aid of Variety include hosting Silver Heart Dinners with the likes of Paul Gascoigne, Sting, Mark Knopfler, Denise Welch, Tim Healey and Stephen Tompkinson (pictured right). Variety are well known for providing their Sunshine Coaches to local schools and clubs, especially those with special needs, to help them get out and about to enjoy a more fulfilling life. Nattrass Primary Academy is a fully inclusive, successful mainstream primary school that also offers specialist provision for children with a range of social, emotional and mental health difficulties and learning difficulties. It prides itself on offering a curriculum that is adapted to meet the needs of every child so that all thrive in this environment. 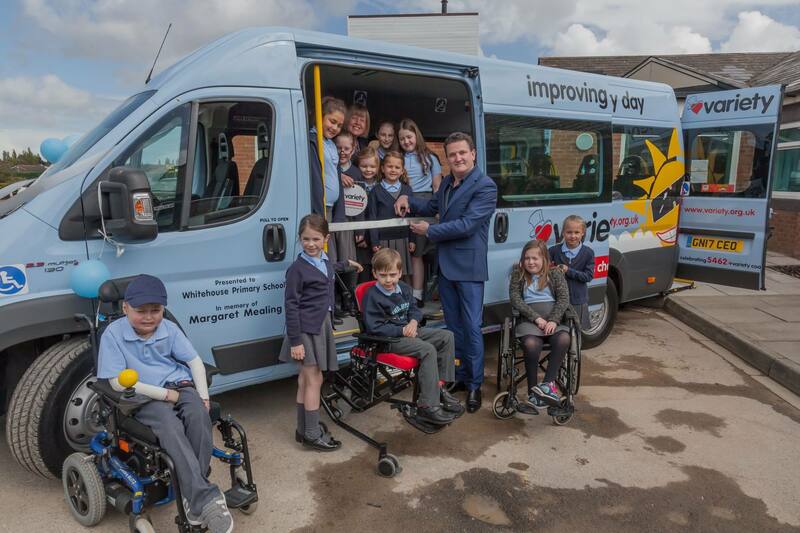 The specially designed vehicle, sponsored by the Margaret Mealing Legacy, will be used to transport children on a number of educational and social outings. These outings will provide pupils with experiences outside of school in a safe and secure way. The coach will be used on school days and for afterschool and holiday clubs. ‘Goffy said "It’s a real thrill to present these coaches here on my patch. I love the work Variety does here in our region, and I know the joy and pleasure these coaches will bring to so many youngsters." Caroline Reed, Principal of Frederick Nattrass Primary School, said "The curriculum at Frederick Nattrass includes a wide number of essential experiences that we want every child to have - simple pleasures such as playing in the forest, jumping waves at the beach or enjoying the local countryside. 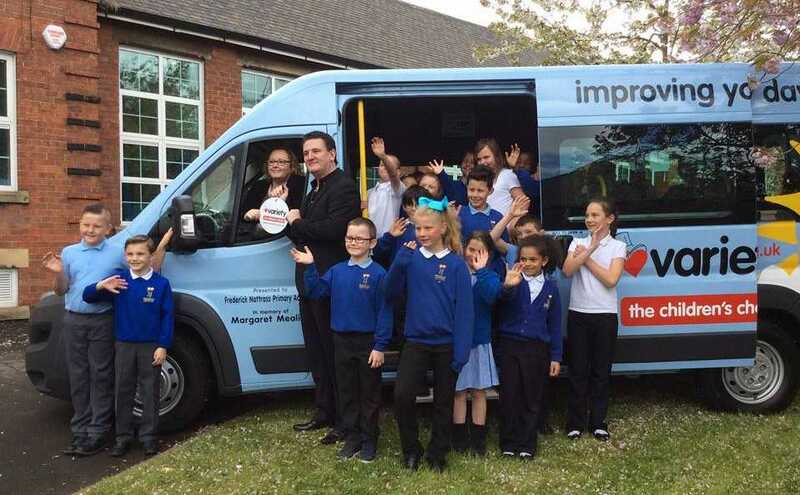 This minibus will enhance our curriculum immeasurably as we will be able to go out every day and allow our children to experience the world around them." Ray Crawford, Regional Chairman at Variety, the Children’s Charity said "With the support of individuals like Margaret Mealing and the amazing fundraising efforts of pupils and parents at Frederick Nattrass Primary Academy, Variety can continue to give disabled and disadvantaged children and young people the ability to get the most out of life." Whitehouse Whitehouse Primary School, located in Stockton, is an inclusive school that caters for more than 400 pupils. The school provides specialist provision for 55 pupils who suffer from a number of complex physical and medical needs, including 33 wheelchair bound students. Here's another special day when Goffy went along there to present them with a Variety Sunshine Coach. The donation of a Sunshine Coach will be hugely important in ensuring that these children have the same opportunities as their able bodied peers and will be instrumental in enriching their learning experience. Variety’s Sunshine Coaches have helped improve the lives of thousands of disabled or disadvantaged children across the UK. The coaches enable schools to take children on education and recreational days out allowing children to explore places they would otherwise never have visited. If you would like to find out more about how you can help this wonderful charity Variety, perhaps through a Gift in your Will, please contact Monica on 0207 428 8117.